This ground level self contained 2-bed apartment is the ideal property for a leisure break. Located on the edge of the Peak District, and centrally located in the town of New Mills, the property is well situated for local amenities (bars, shops, restaurants), and outdoor activities. Positioned next to the river with convenient access to the local attractions of The Torrs, Sett Valley trail and Millenium walkway, plus a range of towns and attractions around the Peak District. Property is 5 minutes walk to the train station, offering direct services to Manchester (<30 minutes) and Sheffield. The property has two spacious bedrooms, lounge, kitchen, family bathroom (with separate bath and shower). Use of private patio and garden area of main house. Off street parking is also available. 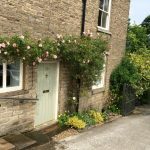 Property is within a large stone built house with many period features, and benefits from central heating, smoke alarms, carbon monoxide alarm. Property is suitable for couples, or families, and baby high chair and travel cot are available on request.